Ernie Perez, manager of instruction technology, has accepted a position as director of instructional technology at California State University Northridge effective Oct. 15. 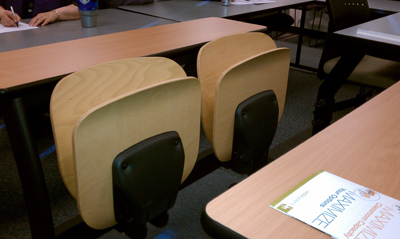 In May 2011, Information Technology Services began updating technology in many of the general-use classrooms on campus. Since that time, new equipment has been installed in a total of 42 rooms in 11 different buildings. This includes a projector, a simple control panel, switching equipment, and sound amplification. These systems are based on new digital standards that allow for HDMI, VGA, Component and Composite inputs to be connected. The majority of the classrooms that were updated also had new white boards installed provided by the Division of Facilities. K-State faculty/staff who will be using the university technology classrooms for the first time this summer must attend a short training session before they can request keys for those classrooms. Once training is completed, instructors can request keys through Facilities Key Control in Dykstra Hall. For more information, see the Technology Classrooms website. iTAC and the Division of Facilities are currently in the planning stage for room renovations and technology upgrades in the Bluemont 101 and Cardwell 101 lecture halls. These changes are scheduled (contingent upon funding) for summer 2012. We would like to take this opportunity to hear from faculty who are using or have used these rooms, and get input and feedback on what changes or improvements they would like to see. Since May, Information Technology Services has been busy sprucing up the campus network, upgrading technology, and more. Below is a short list of the projects that occurred over the summer. ITS completed a total network upgrade to Fairchild Hall, and added wireless in Ahearn, Call, and Willard halls. The average number of users during high usage periods is approximately 6,700. ITS is in the process of a total building rewire for Cardwell Hall plus new electronics. ITS installed a new network access control system, SafeConnect in the residence halls which ensures that computers are up-to-date with operating systems, patches and antivirius configurations. 3. Nine more technology classrooms. Nine general-use classrooms that are part of the upgrade for 50 rooms to basic technology were completed. The rooms include 112 Bluemont Hall, 208 Fairchild Hall, 216 Kedzie Hall, 2 Natatorium, 162 Seaton Hall, 132 Waters Hall, and 120, 122, and 123 in Willard Hall. The technology includes a projector, a simple control panel, switching equipment, and sound amplification. These systems are based on new digital standards, allowing for HDMI, VGA, Component, and Composite inputs. Additional general-use classrooms will be completed over the next two years. 4. Parking services and textbooks. ITS worked with Parking Services to update the Parking System. ITS modified the information available to students on the textbooks by adding two additional links for textbooks accessible from the Student Services Center in iSIS. In conjunction with Communications and Marketing, ITS rolled out the new content management system to make it easier for units across campus to upgrade webpages. ITS also changed the messages that users receive when there is an error locating information on the K-State Web presence. Watch K-State Today for upcoming information on technology happenings. This is a friendly reminder that all K-State faculty/staff who will be using the university technology classrooms for the first time this fall must attend a short training session before they can request keys for those classrooms. Once training is completed, instructors can request keys through Facilities Key Control in Dykstra. For more information, see the Technology Classrooms website. Instructional technology staff will be available to provide training through the next few weeks and after the semester has begun. Fill out the Technology Classroom Training Request Form and someone will contact you to schedule a session. Once you have been trained in one classroom, you will be cleared for access to all other technology classrooms. Instructors who have received training in the past are advised to attend another session if they are teaching in a different classroom or if they need a refresher on the equipment. More information is available on the Technology Classrooms website. Contact Ryan Hagar, 785-532-4924, rhagar@k-state.edu. To report problems in a technology classroom, use the Technology Classroom Problem Report Form. Information Technology Services, under the direction of Ken Stafford, CIO, provided funding for 50 new basic technology classrooms over the next two years. 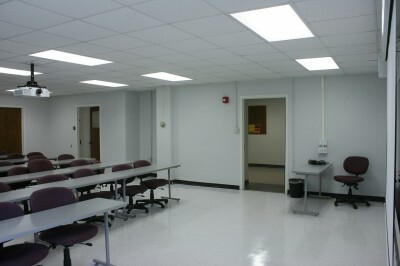 The first room, Willard 122, was completed by the Information Technology Assistance Center (iTAC) in late May. The install includes a projector, a simple control panel, switching equipment and sound amplification. The new system based on new digital standards allows for HDMI, VGA, Component and Composite inputs. Umberger 105 will be undergoing renovations over the summer. With faculty input, Facilities, iTAC and others have planned an updated space for teaching and learning. See a drawing of the new layout (PDF) as well as a picture (below) of the new seating. Faculty/staff who will be using the university technology classrooms for the first time must attend a short training session before they can request keys for those classrooms. Once training is completed, instructors can request keys through Facilities Key Control in Dykstra. iTAC’s Instructional Technology team, which supports all centrally funded technology classrooms and university computing labs, has had some staffing changes. This is a reminder about how to get assistance in these environments. For immediate assistance while in technology classrooms and studios, call the Hotline at 785-532-5798. To report non-emergency problems in a technology classroom, use the Technology Classroom Problem Report Form to submit a problem report. More information is available at www.k-state.edu/infotech/classrooms.